This condition is a form of acquired flat foot affecting adults and children. The posterior tibial tendon is one of the most important tendons of the leg, its muscle arises from the back of the tibia and fibula and winds around the inside of the ankle, the main part of the tendon attaching to the navicular bone on the inside of your arch. 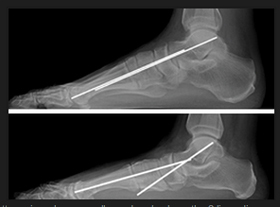 The main function of the tendon is to hold up the arch and support the foot when walking. Increased foot pronation results in increased load and tension on the tendon and can lead to inflammation of the tendon, or its attachment and potential rupture, the tendon loses its ability to hold up the inner arch of the foot leading to dysfunction. 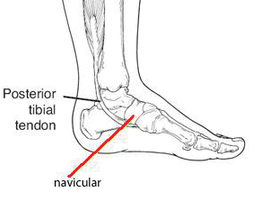 Pain and swelling occurs along the length of the tendon as it passes behind the inside of the ankle, especially over it’s attachment to the navicular. This condition is common in runners, skiers and skaters. Top: Shows the normal arch where the two lines are parallel. Bottom: Shows collapsed arch where the two lines diverge from each other.